Only a few of us who had worked on the Android Instant Apps project were aware that we had just pushed to the developer track, the first step in getting our Instant Apps to the Google Play Store. And only a few weeks later we had a working version ready to be whitelisted for production. Working with Google as part of the Instant Apps Early Access Program(EAP) was an incredible experience for our team. It’s always challenging, and sometimes even a bit scary to be at the very cutting edge of technology. At Ticketmaster we have always believed that “game attracts game”, so it was with great pleasure that our team took on this challenging opportunity. Starting from a boot camp at Mountain View, through to our demo at Google I/O, it was certainly not as “Instant” as the name may imply. If you work at a large organization, re-architecting your existing application to support Instant Apps, like any new technology, takes a bit of imagination and perseverance. We had to lean on other engineering teams like Google and Branch to help get to our desired experience. In the end it was well worth it. We are happy to have stayed true to our initial vision of using our Native OpenGL seatmap to create a truly unique Instant Apps experience that will provide new ways to attract fans with a better mobile experience. By pushing our vision to Google, we have helped to clear the roadblock for other engineers eager to use Native Libraries (NDK) such as gaming and camera applications in Instant Apps, and made a small milestone in what we believe will be a bright and exciting future for the Android platform. Find a way to tackle technical debt as part of your Instant Apps refactor. Tech debt has been a large part of my work at Ticketmaster, which I expanded on as a metaphor in a blog post back in 2015. In our case, our Instant Apps architecture was able to speed our migration to the Model View Presenter (MVP) architecture pattern while also helping to move away from a deprecated networking stack, and to push forward in development against the new Ticketmaster Open Platform API’s. Developers don’t want to do throw-away work, so building something that will stand the test of time is a goal everyone can get behind, as well as providing new areas of growth. Instant Apps show the full benefit of the native Android platform. It helps to highlight the latest conveniences like SmartLock and Android Pay. Become an advocate for the Android platform by highlighting key advantages over your mobile website like material design effects and reduced purchase friction. Initially we had a hard time understanding what data we needed to contain within our Instant Apps links, and how best to configure them, both in the Ticketmaster instant app and our full app. Teaming with partners like Branch made it possible for us to include extra information in the links that we would have had trouble supporting, including adding support for non-Android platforms. We used Fabric for easy analytics tracking in real time. It’s important to work out the details of your instant app links as soon as possible so that you can focus engineering resources on building out the key functionality in Instant Apps. Don’t be afraid of aiming high. Native platform advancements have the ability to blow conventional websites out of the water. Although initially Google was not able to support our native seat map, they eventually were compelled to support our use case in their initial public SDK since we were able to work with them. It’s always a good sign when your company is “pushing” Google, one of the most advanced software companies in the world. We will continue working with the Ticketmaster Product team to make this into a great fan experience now that we have resolved the engineering challenges to support our seat map technology. 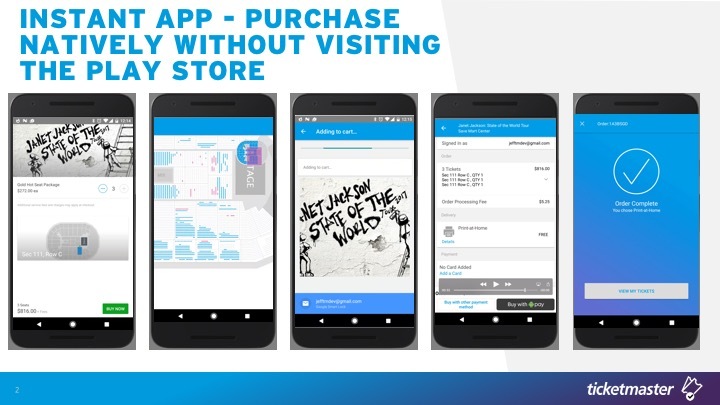 Last but not least, we would like to thank all the people at Ticketmaster, Google and Branch who helped us develop our Instant Apps Demo for Google I/O. Kanak Siwach and Aadithya Bangalore Keshavamurthy were both especially helpful in pushing development of our Instant Apps in their 10% time. Henry Ciruelas(@hdigga) is a great leader and manager and our entire QA team are the best in LA tech. We are looking forward to working with Google and the rest of our team to improve and advance this exciting technology. We know our fans deserve the best-in-class mobile purchase experience and believe that Instant Apps will help us rock the tech world!